Angelfish, Discus and Guppy enthusiasts all have their own "bibles" but (with the exception of the glut of Corydoras books out there) there is no such single-mindedness amongst the catfish book market. A book focusing on a single catfish genus is to be welcomed. Even better when the subject matter is that of a somewhat neglected and murky area of knowledge. This is supplemented by an appendix detailing the collection locations of Ancistrus spp. and a list of literature cited. Mostly colour photographs appear throughout. that range from quite poor to excellent in quality. Additionally a refreshingly large number of maps, tables, charts and graphs grace the pages to graphically convey various points. Most of the book is written at an accessible level, to some this may seem lightweight to others increase the level of usefulness. In my opinion the chapters that deal with classification and biology are spot on but the section on species of Bristlenose is too light. For those of you wondering what the difference between "Bristlenoses at home" and "Keeping Bristlenoses in the aquarium", you have to think of this from the fishes perspective. The former chapter details natural habitat and life of a Bristlenose in the wild, the later how best to recreate it in our homes. These chapters and the next one which provides information on spawning Bristlenoses are, in my view, the best parts of the book. The only downsides I could think of are omissions, pictures of the undescribed L or LDA numbered Ancistrus spp. would have been useful as would more information on the more uncommon species in general. 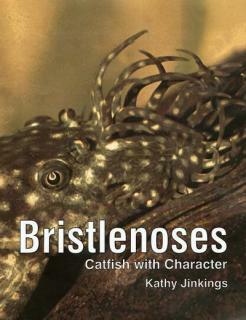 The author is a big Bristlenose fan (in fact she wrote our catfish of the month article on Bristlenoses) and this is apparent from the books effervescent, enthusiastic style. Overall, accessibility and usefulness are key to this being a solid addition the catfish keepers library. Back to Book Reviews index.